NOTE: This is the final review period so this journal entry was the last. I’ve be doing the usual reading and looking; Ellen Pearlman’s Nothing and Everything is very much where I sit in my own world view and has led to helpful reflection. I had some pieces in an art exhibition, Elemental, in the Dungeness Nuclear Power Station with Ashford Visual Artists. EDF, the owner, was really helpful in setting us up in a novel environment for an art show. I showed three pieces, two were abstract landscapes, and the other was an interpretation of quantum energy states (an interesting tension between modern science, and some very old thinking about the nature of the real world). I got to meet the mayors of the Cinque Ports, which has great historical resonance in this part of the country. Dungeness itself is a desert and I find it hugely stimulating. I need to let paintings have space to breathe on the surface and not try to fill the available space. Review 4 explored this but not particularly successfully as my objective to develop free floating images did not address exploration of colour choices sufficiently as the critique noted. I have, though, revisited the pieces done in Review 4 and ‘refined’ the colour treatment. No piece is included here. I am reassured that glazing, working wet and mixing on the surface are effective approaches. I have done a lot of paintings where this layering of paint is the primary approach to colour formation, to elicit various emotional and visual reactions. I sent a response to your 4th critique on my use of glazing to produce layered colour fields. Untitled mediaeval geometric in this review illustrates this with a motif (appropriated?) from illuminated manuscripts. I am slowly becoming more comfortable bridging my work in Sumi-e to (monochromatic) abstraction, and transitioning from Japanese papers to other surfaces. I’ve started exploring this approach by looking at some of my photographs (I used to do a lot of abstract photography with leaky cameras and broken lenses), which yield an ambiguous visual treatment. See Untitled Abstracted Landscape for this review. My experience in France seeing the work of Anne-Eva Bergman is still working through in my mind as she abstracted from the landscape. I have continuing challenges deciding whether to work introspectively (noumenon? ), or use landscape (more widely, the visual fields we see), in a way that is cognitively challenging and interesting. This is also a feature of Untitled Abstracted Landscape. The piece I chose from the 1st Review is Fire and Ice. This was the first piece I worked the paint with plastering tools and was a watershed is some respects. This led to me working more often on wood panels and produced the pieces such as Emergent, which got confused with Richter… and again the comment on colour choices; that review also included the free-floating (Field) pieces. It sits in contrast to the work submitted for this final review. Parting Shot: why keep painting? I have found the commentary and thought processes helped me locate myself within the act of painting, so it is natural now to take stock and reflect. I had some difficulty with the suggestion arising from the 2nd Review about dimensionality, which led to an experimental piece for the 3rd Review (Shades of Blue). While you liked this, I am unconvinced this is a direction that unpacks my own reasons why I paint. I’m asking here “what is a painting”, (perhaps more in the spirit of the critics, “is painting dead”). I would distinguish such claims of demise from the behaviour of the art market (which is defined by curated taste), and perhaps what comes out of art schools (in the main, failing institutions as I’ve written about). Clement Greenberg (why is he so vilified?) described some art as polyphonic (a music term) and monotonous. His easel crisis of 70 years ago is/was likely real; today, would much art be called “polyphonic randomness” (or algorithmic polyphony, or “noise”). But I think this is to conflate “art making” with “mark making” and associated tools and techniques – a bit like confusing a writer’s manuscript with their handwriting style. This would reduce artists to “technique-istas”. If this is what is meant by “zombie formalism” [ZF] then Michael Findlay’s The Value of Art is the travel guide that unpacks the art market as an invisible spasming hand (rather than Adam Smith’s invisible hand). How do I avoid going down the ZF rabbit hole, though? Alva Noë proposes that art is an experimental and organising approach to constructing meaning and which positions art within human cognition; this jives with views in Thinking Through Painting, which takes abstract art as quasi-persons. I think these views say that art cannot be meaningful if it is solipsistic (by definition) and self-indulgent, a helpful distinction to remind artists to have something to say. For me, painting is a cognitive act of creation rather than a performative act. But the zombie stuff has me worried. This entry was posted in Arts and tagged Education on February 15, 2018 by naphumber. NOTE: This review involved my main mentor and two of the other course mentors commenting on the submitted work. The reflection has focused on the challenge of developing not so much a ‘style’, but a visual vocabulary. Does that make sense? I quite liked the work of Pae White who speaks of exploring spaces between things. Juan Usle was a real treat to discover; I learnt he paints to the rhythm of his heart, much as the late composer John Tavener used his heart murmur as a natural metronome. The reference to Taschist work was new, but the link to Cobra helped (there’s a Bruxelles restaurant full of the work of the Cobra artist Alechinsky). While I don’t do tapestry now, I have been influenced by how light is mixed on the woven surface since blending light leads to white not black. I think you understood the objective of the Emergent works, which were about how patterns emerge from complex even chaotic systems and the result is in the mind; as I wasn’t channelling Richter, I think of these now as exploratory rather than end pieces. The critiquing has helped me reflect on the purposefulness of what I’m doing, rather than just pushing paint around. This led me to look anew at the way I went about thinking through what I paint. A number of ‘trajectories’ emerged from this reflection of which two are for review submission. The first trajectory for want of a rubric, I’ll call Fields: What I did was replace geometric shapes with more gestural ones, gave the shapes more room to breath, and did not cover the surface with a colour overlay. The results capture space more materially than in previous work where everything was under layers of glaze. These are giving me a way of bridging to Sumi-e (and more Zen), through ambiguity and simplification. What had been a block to overcome was the boundaries of the worked surface. Colour is now more challenging, as I’ve usually mixed on the surface so need to see how this works procedurally so colours lack subtlety at this stage. I suspect I’m rediscovering something already in the aether, but is usefully challenging the starting points I had when I entered this programme, so I am not where I started, which is good. The second trajectory is about Framing: I took Missing Shade of Blue from the last round and reworked it. The piece is more documenting this than a final piece as I need to think on this further. I have done a lot of paintings where they are layered using tape to cover areas that get painted over, then removing the tape. The tape in this case sharpened the framing and the shades of blue, which are randomly covered with thin paper. This is more structured and perhaps a polar opposite to Fields. I think this might help me explore the unstretched/unprimed canvas creating painted tapestry, and introduce fabric considerations more. Artistic journeys this period included visiting Domaine de Kerguehennec in Brittany for an exhibition of Anne-Eva Bergman, “l’Atelier d’Antibes 1973-1987”. Her focus was on abstract landscapes, drawing on her Norwegian upbringing. This proved insightful as I grew up with big skies and land all the way to the horizon with nary a building in sight. I liked “Vague baroque” for its surface treatment and restrained colour. I read “Thinking Through Painting: reflexivity and agency beyond the canvas” (written a few years ago but I just came across it) which explores, inter alia, the view that painting is dead. Parts of the book are written in ‘that’ style that often leaves referents free-floating, but the authors did seem to understand that this obscurity was a problem, though that didn’t stop them from using jargon. That aside, though, two thoughts arise. Is Painting Dead made me think of Francis Fukuyama’s claim that history is dead, in light of the end of the cold war and the apparent success of liberal democracy. Given the events of today, it is hard to image what evidence would support that claim today. The same for painting as it feels to me like a dilettante-esque assertion said more for effect than the evidence base it can draw upon.. Isabelle Graw in her essay does offer a definition of painting as: “a form of production of signs that is experienced as highly personalised”. My view is that Merleau-Ponty’s work is more relevant here than the authors’ attachment to critical theory and all its baggage. This definition does at least put art into the cognitive experience of the maker and of the viewer. The notion of painting as quasi-persons may not withstand scrutiny: objects such as paintings seem autonomous because of agency and indeed meaning attributed to them either by the artist or the (informed?) viewer; they become autonomous from a social process where they become iconic and thus stand on their own. But not all “art” is Art. The other thought had to do with the commentary, in an eschatological context of Tuymans’ Gaskamer. The point, in the context of this painting was of the impossibility of representing some things. Can this be true, I wondered? If something can be thought, it can be expressed (verbal, musical, visual). That one may not know how to do it is irrelevant. And that one may feel an impulse that representation is strictly not possible seems more about arbitrary limits (censorship, political correctness) than human cognition. At the time I was thinking about this, I saw the film Denial, the court case between David Irving, the author of books on the holocaust, and Penguin Books (Deborah Lipstadt the author). There is a scene in Auschwitz when the lead barrister for the defendant is walking around one of the collapsed gas chambers and is seen by the Lipstadt character as not suitably reverential. He makes the point that this is a crime scene; for the defendant it is something else. As art then, such representation depends on context which supplies the basis for meaning; despite what some may wish, all that is solid does not melt into air. In the end the precision of the legal case which demonstrated that Irving lied, is balanced against the defendant’s belief that the proper representation is through survivors’ stories which in the end says that depiction is possible and can arbitrary expression. With respect to the two works on paper; while ‘colourful’ they are in retrospect unsatisfactory when compared to others with a better relationship of elements, and I fear they are too murky and ‘mute’. In respect of your comments on the painting “Investigation of an idea…”, I’m reworking it to tighten the composition. I went back to my tapestries and art photos, and considered your suggestion to be more dimensional. I spent some time experimenting. I made some colour cards and considered how this might work, based on David Hume’s ‘missing shade of blue’ problem on how we perceive a gap in a continuum of colours (a bit like the link you provided, but I’ve tried to ‘abstractify’ it). Broadly, not pleased with the results but have included the process in the Journal notes for this period. I’d welcome further thoughts on dimensionality. I also wonder about scale; I have a great big roll of canvas and I’m keen to paint on the unstretched canvas and hang the paintings more like tapestries (a la Frankenthaler and unprimed canvas). I find it odd to conceal the canvas texture; with paper and wood panels I integrate the surface texture into the painting. Any thoughts on this? The mentor made suggestions about dimensionality and working paper differently. I tested this out in an experimental sequence, beginning with simple layering of torn paper, to cut cards, applied as suggested as ‘paint marks’. These are fun to do but were not satisfyingly expressive. Need to think about whether this is a direction I want to mine further. I found the suggestion to alter the shape of the paper interesting. I have tended to use full sheets of paper and have done work that is differently shaped such as vertical ‘landscapes’. I did a series of paintings on paper that were folded vertically and designed to fit into the corners of rooms – corner art – but framers had a fit. The comments also made me think of the film “Off the map”, which features a 40 foot long watercolour (Stan Berning in New Mexico did the painting). The film intrigued me to think of a painting emerging as a whole over time; I did a painting a month for a year in a bound book of handmade paper, telling a ‘story’ over the course of that year, with fabricated lettering (bit like the Voynich manuscript). One of my early explorations was with torn paper, and I have thought how to blend paper and tapestry technique. I did a series based on Fibonacci ratios, and used that to build up layers of images. This was an early exploration of tapestry-type approaches to the painted surface. Here are some examples. With tapestry, I have done free form shapes (Breastplate), and object-as-loom (Adz). I find it interesting that paintings are done on a woven cloth surface that the artist often goes to great lengths to make invisible, so I took one of Kelly’s paintings and embedded it in a fabric/tapestry structure. (The Idea). Tapestry was enjoyable but tough on the back and even with two looms on the go it was very slow….. Following the 1st review, I’ve started a Turps Journal where I’ve addressed issues in more detail, with illustrations, your comment about origins of work. I am mindful, as you noted, to avoid narcissistic starting or end points; it seems the way out of that rabbit hole is actually the notion of sunyata (emptiness). Two paintings so far from the first two shows: “Investigation of an idea under suspicion” was done very much in the moment, built up in layers (4 colours were used) and is more spontaneous. “Emergent” is testing the boundary between finished and unfinished, through the notion of emergence. Looking again at Investigation, following the ING show, I think I need to leave more white space for the images to breath and be less bounded by the surface itself. Your comment on measuring success struck home. Abstracts are in some respect always failures or at least approximations of the ideation; getting it ‘right’ in some sense is impossible, at least empirically. But perhaps no one notices apart from ourselves, as each piece is itself an abstraction in the way to the next. This makes me more comfortable with the pieces that I think don’t work, but makes me wonder how to better integrate the process from one to the next: I tend to do one piece at a time, and if the idea holds, then a couple more emerge; should I think more in a series? I have thought further on abstractions that use science as a starting point, as apart from, say introspection. The bonding of the subjective and empirical will never be a happy one, if all an artist is doing is visualising scientific phenomena, rather than what they mean. For instance, what is the visualisation of the physicist’s view that reality is made up of “fields”? This is to draw a parallel with Cubism and Relativity Theory. Conceptually, the two pieces I put up on Private View (sfmuto technique) is each a 3D painting (surface and layers) and the image is more how fields produce the phenomena we associate with the real world and which scientists study. I read Kantrowitz [http://www.andreakantrowitz.com ] “The man behind the curtain, what cognitive science reveals about drawing” (J Aesth Ed, 45(1)2012: 1-14). This has helped influence my perceptions and no doubt will influence practice. Few of my works arise in a linear process from sketches. Instead, a sui generis approach achieves a degree of disintermediation of the creative process, using the first marks as the starting point (in the sense of De Bono, it doesn’t matter where you start as long as you start). 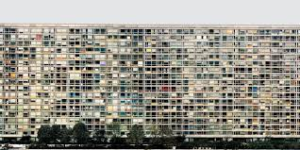 I often find photography a helpful prompt; photographers such as Edward Burtynsky and Andreas Gursky have photographed scenes from high and distant perspectives. Montparnasse conveys urban isolation. It is anticipated that the bulk of humanity will live in cities in the future. This is not something necessarily to be celebrated, though. I did a sketch looking at the wall of Toronto building lights from my hotel room; I used to live in Toronto, so the city is familiar. While the gridded type structure did not end up on the paintings, I took a perspective looking down, to capture the immensity and isolation. I put in little red marks for figures, but in hindsight, think they would be better left out. One of the paintings was chosen for the cover of a local magazine, which I thought odd, given my area is quite rural. 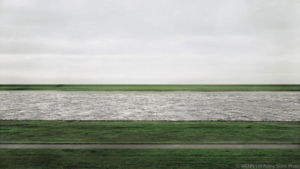 In Rhine II, Gursky shows the strong lines in the landscape. 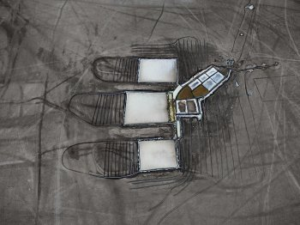 I painted a series “Six view of Dungeness” with that imagery in mind, but no sketching. Ellsworth Kelly did plant paintings throughout his life, and which were broadly ignored; however, they are seen as a significant creative source. For Kelly, they offered him a “bridge” as he called it to his abstraction. After the fact, it is much easier to explain, but how does it explain the here-and-now for him? I suspect they were to him a type of ‘found moment’, without antecedent which is important to understanding how he then approached the plant itself. By pruning the plant to the immediacy of his cognitive experience of it, I think he found a way that allowed him to empty his mind of ‘ego’ and self-aware cognitive processes, to get to the unmediated experience of the plant. The progression from that to a particular abstraction may not be direct, but it is the same mind at work. I explored this process in the sequence below, to the level of something broadly representative but have not progressed to using this to do anything that would be an abstraction in a meaningful sense to me.. I explore many ideas using Sumi-e technique as it helps me explore the here and now, and freer expressiveness. They are not really something on the way to something else but stand for themselves from which I get ideas for other pieces. These examples are all about 30 cm on a side, but I have sheets of Japanese paper up to 2m in length to explore when I’m feeling more courageous! The visit to Bozar in Brussels was useful in two respects. The Japanese expressionists presented works that were more gestalt in nature (all over abstraction). Mixing the paint on the wood with paint scrapers, I used more curves than I’m used to, producing “Investigation of an idea under suspicion”. The Avant-Garde show had me asking what makes a work Avant-Garde and not something else; indeed, the demarcation seems unclear and I wondered what made the AG, apart from self-description; perhaps that is the historical point. Eliasson’s Ventilator was shown; he says it is a work viewers need to complete (co-produce); doing this is also an objective in my work. However, I found the work a bit empty in the co-production sense. If the point of AG is to make a break (rupture appears to be the preferred word) with what is taken as received wisdom, I wasn’t clear how this worked. The show positioned AG in military art, and a fascination with technology, invention, machines, as well as war, weapons, positioning them as the hinge points or watersheds; this is a particularly aggressive interpretation of the work, and may indeed exclude wider logic. I left still wondering how AG is to be played out today, despite a suggestion of apocalypse and prophecy. Is that an interesting, intelligible and even accurate proposition? I worry about claims like this lapsing into empty commentary (much of the exhibition catalogue is unintelligible). Can one really be an Avant-Garde artist any more? This entry was posted in Arts and tagged Education on February 11, 2018 by naphumber. I try to position my work in the ‘here and now’; our brains see things before ‘we’ are aware of them, so I’m trying to get at that point in my work. The locus of attention is on the immediate. This is, as you note, risking a theosophist or mystical position, but I am trying to get inside the cognitive rather than euphoric experience. I read Klee, but had not read Kandinsky. I had found Malevich’s ‘The Non-objective World’ thought-provoking. I’ve also tried to make sense of the art/science connection. Your commentary on the illustrations was interesting. I have gone to shows at the e.g. Wellcome Trust and come away a bit underwhelmed. In Arthur Miller’s “Einstein, Picasso: Space, Time and the Beauty That Causes Havoc”, he observes that Cubism was Picasso’s way of visualising relativity theory. I don’t see in the art/science collaborations visual power of that order. I guess I’m hoping that artists will get beneath the ‘surface’, perhaps try less hard to work from the obvious scientific imagery, and grasp the underlying and perhaps more relevant dynamics. The physical world actually does not exist but is made of fields; we just think the table is solid. While I like the early art, right back to the cave paintings, I am moved by the abstract expressionists, and see relevance as a mode of thinking rather than a ‘style’ or an ‘era’. It is just the historical bit in between that I understand less. You observe that I use a variety of approaches. I worry that this shows less commitment to a particular form of expression. How do artists balance the authenticity of their own endeavours to explore, with work that expresses their personality if methods keep changing, or is that just me worrying it is a weakness? That made me think about the comprehensibility of my paintings and whether they were ‘successful’. Kant has a term, ‘ding an sich’; I want my paintings to be the thing itself, but while not about a nameable reality, they are about one with referents and meaning that can be known. I would not want my pieces to be mute (or indeed have that “Narcissistic echo of self-reference”). I accept that the painting itself is an object distinct from what it depicts. Taking all that together, I’d propose that in the TURPS course, the challenge is to identify my set of exigencies, understand the visual lexicon I’m using and how it might evolve, and produce art from that learning. Between 2016 and 2017, I participated in a distance-learning mentored programme to improve my painting. The course is offered by Turps Art School in London. I had to submit a portfolio to be accepted, along with about 40 other painters from around the world. I was thrilled to be involved and kept a diary which I’ve now posted to my blog. There are 5 review periods, and I’m only sharing my own comments until I secure permission to post the comments of the mentors. My solo exhibition, Chromophilia, was held at the Evegate Art Gallery from 3 to 24 December 2016. Works are on paper and wood. The gallery is open from 1000 to 1500 Monday to Saturday (but not Sundays). Evegate Art Gallery is in the Evegate Business Park, which includes retail shops and restaurants. It is located off the A20, East of Ashford, Kent. For the GPS, the postal code is TN25 6SX. The image is an example of the work. This is acrylic (sfumato technique) on 450 GSM paper, 56x76cm. This entry was posted in Arts and tagged Exhibitions on November 20, 2016 by naphumber. Departing from my usual commentary on arts subjects, I would like to let folks know that I have been accepted into the 2016-17 Turps Art School Correspondence Course. This will be a challenging opportunity and I look forward to working with my mentor/tutor. At this time, I don’t know who the other artists are in the course but I am sure we are all interested in each others’ artistic journeys and sharing of perceptions, perhaps through joint activities. As a painter of abstractions, I focus on the materiality of visual perception, by giving physical presence to ideas. This has been the drive of human creativity since the first marks on stones or we made the cave paintings, and has inspired artists to consider alternative realities. Cubism for instance is the materiality of Einstein’s relativity theory. Malevich understood this as did the Futurists. Exuberant exploration is found in the Abstract Expressionists and thoughtful work since then, not just in painting but in sculpture (despite some distractions along the way when artists lost their way and their voices). No doubt I will post further as the course proceeds. This entry was posted in Arts and tagged Education on September 18, 2016 by naphumber. Marion Milner, a celebrated child psychoanalyst wrote of her own creative anxieties in her book On Not Being Able to Paint (Heineman, 1950, but still available). Fear is embedded in much of the writing on creativity, mainly because creativity is a public expression of internal life. It is a form of exposure, and ever mindful of judgemental others, we often are more afraid of what this exposure, than the actual creative results themselves. In most cases, despite self doubts, we are proud of our creativity, but know where it is deficient — we’re just nervous about hearing that from others. Milner’s point rested on various assumptions about preconditions for the production of a work of art itself, namely technical mastery of materials. This is obviously in contrast to whether the creative results are personally satisfying, or articulate well what we are thinking. Art is form of expression, not just a meander across a canvas or a lump of clay deformed by idle hands. This despite some art being of this form, of course. Henry Peacock, in his excellent book Art as Expression (Whalesback, 1995) observed that of his art students, the ones that drew well were the least creative as artists, as they were more intent on replicating the form of what they saw, whereas those who drew less well were more inclined to engage with and interpret the external world. Peacock’s book is important as it is provides inspiration for people to explore their creativity without the fear and anxiety of mastering technologies first (like pens and ink, and paint or clay). All these issues are well-addressed in Art and Fear (Image, 2001) an excellent tonic by David Bayles and Ted Orland. Taken together, the fear that drives many to avoid creativity is actually self-imposed and has no bearing on whether we are actually able to express ourselves through various artistic approaches. I would like to encourage creative souls to shrug off their attachment to what things look like and think about how to let your inner perceptions work. The art world has its cycles, from loving the realistic paintings, with figurative precision through to inscrutible abstract constructions which for many may bring on a headache. Abstraction is the true form (sounds like a mantra…), it excites and challenges the mind, is obviously much harder to do, as it requires real honesty and elegant presentation of complex inner thoughts. For others, it is easier to paint the vase and the flower and I accept that for many people this is enjoyable and satisfying. I’m only saying, there can be more. Art methodologists and historians may see artistic periods like the tide — new ideas come in and wash away the old. Once done, it can’t be done again. Some think of it as the shock of the new, as all art history must be constantly rewritten from the perspective of current artistic tides. That does not mean that these perhaps passe modes of expression have nothing to say, otherwise why do we keep them on show in art galleries and museums. You need to look at a work of abstraction for a least 20 seconds in order for your brain to decide that you are really interested and then it starts to process in detail what you’re looking at. Sometimes you have to lose yourself to find yourself. This entry was posted in Arts and tagged Psychology on December 23, 2015 by naphumber. Originally published in Art of England, Issue 65, 2010. Reproduced with permission. Recently, I went to an exhibit of a friend, who with colleagues, produced a piece called “Cases” using iPod videos as an installation probing the nature of health and the senses – son et lumière for the iPod generation. Their work resonated with thoughts I’d been having of the impact of new technology on art. Art and technology have always been linked, but it seemed to me as I looked at the iPod videos and listened to the eight different ‘cases’, that something potentially more disruptive might be on the horizon. What interests me is that new and emerging technologies enable art to be made by a wider range of people, through a social-democratising, accessible and open process. “Who is the artist?” becomes a very interesting question. Commuters crowd many corridors across the city during the morning rush-hour, all is hustle and bustle. Their sighs, words, movements, are captured by sensors, and translated into real-time images which animate the otherwise naked walls. The work is called “I’m thinking of you right now”. My hand flicks, a gesture in space, and a coloured beam races across a wall embedded with nano-particle sized LEDs. I toss the Wii-Art wand into the air and another light curve spreads across the ceiling. The room will remember what I have done, but I can always change it later. The 3D printer buzzes on the table beside me, chunks and bumps while a 3D sculpture takes shape made of polymers, resins and colouring. I have created a probably impossible object from samples of space that I bundled together with my smartphone camera and downloaded to my computer. Slouching in my comfy chair, I put on the headset to have my thoughts read. I call up the latest issue of Art of England on my Plastic Logic e-reader. The computer records what I am thinking and produces a picture which I can play with later, or print out on canvas. Apparently, some people still use paint – how yesterday! The artificial intelligence, called Alicia, shares my likes and dislikes. Alicia is my writing buddy and editor as I work on my next novel; she has a real instinct for narrative. My friend’s AI, he calls his Boris, is a painter and together they are an artist collaborative. Alicia apparently wrote Boris a poem. Should I be jealous? One hundred people link their smartphones and flash-art a sunset, capturing what they see and collectively producing a single painting from 100 different perspectives at the same time. The image appears on YouTube and is viewed by 100 million people. 100,000 people buy the image for a pound. I am less concerned with how artists today are using technology. Artists always adopt and test out new technologies, e.g. watercolour, acrylic paint, plastics, video, computer animation, digital printers, PhotoShop or GIMP, and so on. What is significant is that new and emerging technologies lower the costs and time of art-making, and reducing these hurdles increases accessibility for people who in the past found the existing technologies (of paint, canvas, stone, clay) formidable. I think we’re at a hinge-point in art and art-making because of this and which could radically alter what we think of as the ‘art world’. In the end, anyone can be an artist. Technologies will facilitate creativity to enable more people to have artistic expression. The Web and social media make collective art-making possible as we move beyond individual authorship. There will be implications for art schools – whom and what they teach; commissioning bodies — whom they support; galleries – what they are like; and artists – what they are for. And the meaning of art will change. Art is often thought of as special, in public places, commissioned, housed in galleries where you can’t touch, exclusive, remote. Art can be obscure, requiring specialist interpretation; it is often inaccessible and mute to the majority of people. Through technologies, art will become embedded in the fabric of our lives; it will be ambient and ubiquitous. It will be social and shared as much as individual. By democratising art and art-making, new technologies and social media will make it more important and relevant. This entry was posted in Arts and tagged technology on November 19, 2014 by naphumber.